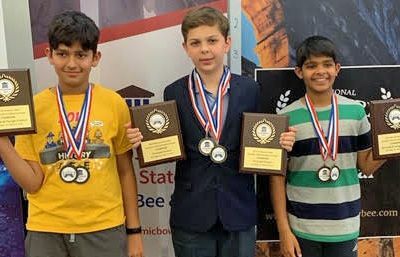 On March 16, fifth graders Shaurya M. and Suraj S., and seventh grader Max R., placed first in the 2019 Southern California Regional Bees, held at Iftin Charter School in San Diego. The Southern California Regional Final included the National History Bee, National Science Bee, and US Academic Bee. Shaurya M. was awarded the fifth-grade champion in the US Academics Bee and regional champion in the Science Bee. Max R. was awarded the seventh-grade champion in both the National History Bee and US Academics Bee. He also qualified for International Geography Olympiad. Suraj S. was awarded fifth-grade regional champion in the National History Bee. These three scholars will proceed to compete in Nationals, to be held in Chicago in June, 2019! Stay tuned for updates. Click here to learn more about the US Academic Bee and Bowl.